Probably due to me and not the recipe but the fritters fell apart in the deep fryer. But were more healthy pan fried anyway. Great option for kids lunch. 7.15 H made - scrummy. So delicious will certainly be having this again. I substituted chicken breast but didn't feel it went dry. Followed this recipe without any variations. A hot curry - so did not serve with chopped chillies on top as I felt there was enough heat in this dish as it was! Looked amazing and tasted just as good as it looked. Even better the next day! Subtle flavours; I would recommend making the meatballs and sauce a day in advance to let the flavours develop fully. This is going to be a regular family meal in our house!! In his new Channel 4 series TV chef Gordon Ramsay embarks on a culinary journey around India, discovering the breadth and depth of cooking of the country. His new cookbook is packed with the best recipes from his travels, showing you how to cook authentic dishes that are bursting with flavour. Three-star chef Gordon Ramsay's favourite food is one that he shares with a lot of Britain - curry. But, until now, he's never been to India to see how the real thing is cooked. Accompanied by a Channel 4 film crew, Gordon takes the culinary trip of a lifetime to discover real Indian cuisine and share this collection of over 100 of his favourite Indian dishes. As you'd expect from a Michelin-starred chef, Gordon brings his eye for perfection and ability to judge flavours perfectly to his exploration of Indian food and shows us how to cook authentic, mouth-watering dishes from all over this huge and varied country. He visits Kerala deep in the South of India to bring us spicy, coconut-based curries and travels to colourful Rajasthan to learn about the creamy, flavourful dishes of the North. Along the way Gordon experiences the hugely different flavours and spices from the different regions and absorbs local cooking styles and traditions. Throughout his culinary journey, Gordon selects the best of the vast array of Indian spices, now readily available in British supermarkets. He shows us how to use these authentically to produce a beautifully flavoured Indian dish. 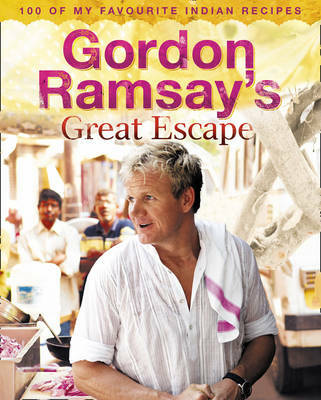 Gordon Ramsay's Great Escape includes over 100 recipes in the following sections: Everyday, Entertaining, Quick Lunches and Healthy Dishes. Once Gordon shows you how easy it is to put together authentic Indian dishes, you'll never look back.